Plans to acquire and exhibit the print collection in this catalogue began in April 2006, and the authors are grateful for the immediate support they received in the Ashmolean Museum from the Keeper of Eastern Art, Oliver Watson and from the Museum's Director, Christopher Brown. In addition we wish to thank Timothy Wilson, Keeper of Western Art, who kindly offered the Eldon Gallery as a space to exhibit some of the new acquisitions while the Eastern Art Galleries are closed for the Museum's major redevelopment. The project also received enthusiastic responses from printmakers in China, and we are particularly grateful to those who generously donated their prints to our collections. 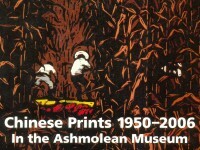 Among them, Li Qun, the oldest and one of the most celebrated artists, generously donated four valuable prints; Chen Long, one of the youngest printmakers, donated one of his meticulously cut blocks; Qijia Dawa, the only Tibetan artist represented in the collection, donated his print not long after having an expensive and crucial medical operation. In the Ashmolean we have benefited from the enthusiasm and professionalism of many colleagues: Declan McCarthy, Publications Manager; Emily Jolliffe, Deputy Publications Manager; Susie Gault, Press Officer; Geraldine Glynn, Museum Registrar; Aisha Gibbons, Assistant Registrar; Alexandra Greathead, Paper Conservator; Graeme Campbell and Greg Jones in the Design Office; Theresa Nicolson, Corporate Fundraiser; Alan Kitchen, Head of Building Services, and in the Department of Eastern Art: Aimée Payton, secretary and administrator; Helen Hovey, Documentation Officer; Tang Jo-Hung, photographer, and the collections coordinator Sigolene Loizeau. We are grateful to them all. We are particularly indebted to three people with long experience in the field of Chinese printmaking: Professor David Barker of the Muban Foundation in London shared his energy and knowledge in assisting with the catalogue editing; Dr. Anne Farrer of the Sotheby's Institute of Art generously shared her expertise and experience in collecting Chinese prints and has given valuable advice from the beginning of the project; Christer von der Burg, Director of the Muban Foundation in London, kindly permitted use of the library of the Muban Foundation. There are other individuals who have enthusiastically supported us in acquiring prints and offering information for editing the catalogue: we are grateful to Prof. Song Yuanwen, the former Chairman of the Chinese Printmakers' Association, Prof. Sui Cheng of Shenzhen University, Prof. Yang Chunhua and Zhou Yiqing in Nanjing, the artist Zhang Chaoyang from Heilongjiang and Prof. Zhang Yuanfan of the China Academy of Fine Arts in Hangzhou. Finally, we feel greatly indebted to Lu Lilian and He Jixing, who for almost three months acted voluntarily in receiving prints, accepting letters from artists and answering queries, and in particular offered their flat in Beijing as store room for new acquisitions. In fact, without the support of all those we mention above, and some who are not named, this project would have been impossible to complete.